Dropbox, the Y Combinator and Sequoia-funded file synchronization startup that makes it easy to share files across multiple computers at once, just hit a major milestone: it now has over 1 million members. 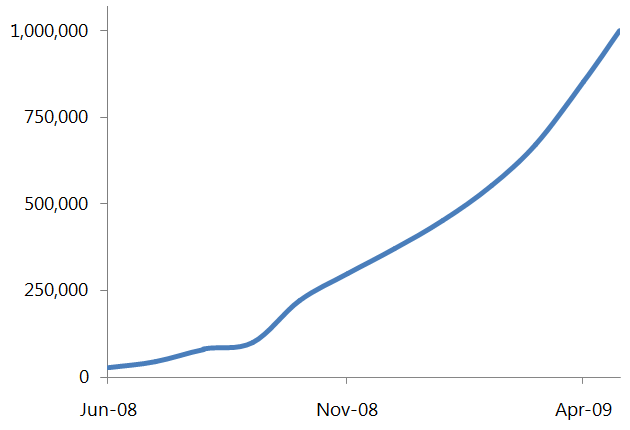 And as the graph below shows, much of that growth has come in the last few months, with over 900,000 signups since the product’s public debut at TechCrunch50 last September. We don’t hear about Dropbox too often (it seems that they’re a bit too secretive for their own good at times), but their product rocks, and is gaining fans quickly. We’ve been using it around the TechCrunch office for over a year now to collaborate on group projects and keep key files handy regardless of which computer we’re using. And we’re not alone – I often hear about other startups that are using Dropbox for their own projects, including Facebook’s Dave Morin. Dropbox is going to be introducing a few key features soon, too. One of them is Peer to Peer sharing, which will allow users on the same network to share their files directly through their routers, without having to first upload them to Dropbox’s servers. The service’s web interface also just got a UI refresh, though many people simply use the folders that the Dropbox application integrates directly into your desktop. CEO Drew Houston wouldn’t talk about how many of Dropbox’s users are paid (the service offers a free version with a limited amount of storage), but he says that the site’s referral program has been driving signups, with the service seeing around 22-25% growth month over month since launch.